VA 221 #1: Appeared in 1923 as a renumbering of VA 22 SPUR running from VA 22 a short distance to the Catawba Sanatorium. The junction with VA 22 was on present SR 779 halfway between VA 311 and VA 320. VA 22 used SR 779 to the junction, then proceeded south on what is now a private driveway heading for the mountain crossing towards Salem. Much of that VA 22 routing exists but is not reachable by car. In August 1928, VA 221 was renumbered as VA 217 and a small bit of VA 209. Today it is part of VA 320 and part of SR 779. VA 221 #2: Designated December 1930 (CTB Minutes) as new primary routing from VA 208 (now VA 117) and US 11 by the Roanoke Airport. In July 1933, VA 221 became VA 118. VA 221 connected to US 11 at the VA 101 jct which VA 118 no longer does. Also, VA 221 ran straighter through the airport area than 118 does today. Creation: Appeared in July 1933 as a renumbering of VA 627. Initially began at VA 3 (now SR 646 slightly south of a relocated SR 709 at the historic Christ Church site. This is the 2nd VA 222. Adjustments: In March 1953 (CTB), VA 222 was removed from the SR 666 loop above Weems. In March 1955 (CTB), VA 222 was removed from SR 709 and put on new construction east to SR 646, then extended east to its current end, replacing part of VA 3. See scans under VA 222Y entry. Comment: VA 222 exists to connect the town of Weems to the rest of the world. From the end of VA 222 you can see the VA 3 bridge over the Rappahannock River. VA 222 #1: Appeared in December 1930 as new primary routing. Began in two pieces: 1. US 221/VA 205 near Floyd southeast about 2 miles (upgrade to CR 8) and 2. VA 20 (current VA 40) near Endicott northwest 5.98 miles (per CTB - this might be a typo of 2.98 miles) toward Floyd. In July 1932, piece 1 was extended east 3.35 miles. In July 1933, both pieces became part of VA 109. Today it is SR 860. VA 222Y: Appears in the 1949 VDOT Route Log (but not 1941) as a triangle setup with VA 3 (current SR 646) at the historic Christ Church site in Lancaster County. In March 1955, VA 222 was moved from SR 709 to its current alignment north. VA 222Y became SR 710. The SR 646-709-710 configuration has since been totally redone and it is difficult to see what it used to look like. Using the 1958 County Atlas and current traffic log distances, it appears SR 709 now bisects what was SR 710 (old 222Y) as it runs into SR 646. Creation: Appeared in July 1933 as a renumbering of VA 629. This is the 2nd VA 223. Initially, VA 223 went to Cricket Hill then east to the ferry to Gwynn's Island, which is well east of the current bridge. Adjustments: In May 1940 (CTB), VA 233 was rerouted to use the current drawbridge onto the island, with VA 233 extended onto the island for the first time. This left behind SR 669 over to the ferry landing. In Oct 1962 (CTB), VA 223 was rebuilt to leave behind the Redart Loop. Improvements: Paved at time of inception; no multilane segments. Posted: Fully posted at VA 198. The last time I was there in 2006 there were no shields on Gwynn's Island. 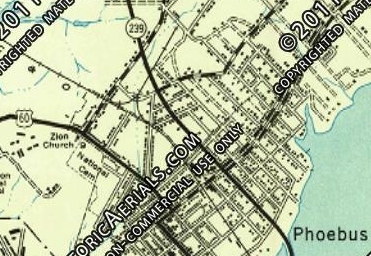 Comment: Official Maps did not actually show VA 233 onto Gwynn's Island definitively until 1976 but the 1958 Mathews County map shows it explicitly doing so. The 1939 VDOT report on primary system development had recommended that VA 223 be decommissioned in its entirety. VA 223 #1: Appeared in Dec 1930 (CTB) as an upgrade to Franklin CR 6. Ran from US 311/VA 33 (now US 220) Boones Mill west 5 miles to just short of Dillons Mill. In 1932 VA 223 was renumbered as the northern piece of VA 219. Today it is part of SR 739. Creation: Appeared in June 1991 (CTB) as an upgrade to the SR 701 corridor running the way it does now. This is the 4th VA 224. Adjustments: The northern end of VA 224 has been reconfigured as part of the Mocassin Gap project. Now, VA 224 NB is the through-movement at US 58-421 over to US 23. In fact, VA 224 is posted from both directions of US 23 as if it had been extended there. Comment: VA 224 provides a good alternative to US 58-421 to Bristol when combined with TN 93 and US 11W. VA 224 wasn't necessarily a straight-up renumbering of SR 701. There are several SR 95x loops that were SR 701 as VA 224 was partly new construction. When the Mocassin Gap project is finished someday, will VA 224 be renumbered as VA 72? VA 224 #1: Appeared in June 1931 (CTB) as an upgrade to Giles CR 6. Ran from VA 23 (current SR 783) Maybrook north 4.12 miles. In June 1932 (CTB), VA 224 was extended north 2.88 more miles to end at CR 6-113 (current SR 700-613) Mountain Lake. In July 1933, VA 224 was renumbered as VA 112. Today it is part of SR 700. VA 224 #2: Appeared in July 1933 as a renumbering of VA 630. Ran from VA 14 Foster south 5 miles. 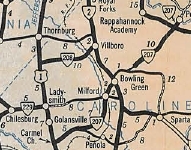 In Aug 1933 (CTB), VA 224 was extended over SR 660 to Mobjack. In April 1951 (CTB), VA 224 was downgraded to SR 660. VA 224 #3: Appeared about 1980 as new freeway construction from US 29 northeast to US 460 (now US 501) near Lynchburg. In 1983 or 1984, VA 224 was extended southwest as new freeway to SR 678. In 1988, VA 224 was extended southwest as new freeway to US 460 (now 460 Bus) in the Timberlake area. In 1989, VA 224 was renumbered as US 460. Creation: Appeared in June 1964 (CTB), running from US 58 to what is now VA 190. This is the 3rd VA 225. Adjustments: As early as 1968, VA 225 was extended south to VA 44 (now I-264). 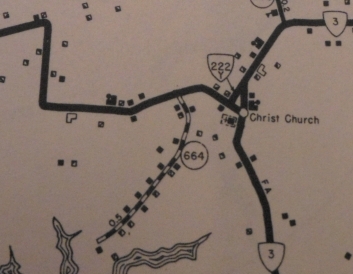 In 1970, VA 225 was extended north as new construction but perhaps an upgrade to a bit of SR 652 up to US 60. Improvements: Paved upon inception; multilane when opened, except between VA 44 and US 58 not multilaned until 1970. Posted: Fully posted at US 13, US 58 and US 60. Not posted at I-264 or VA 190 and poorly posted in between. A white border 225 shield was still up near VA 190 in the early 1990s. Circle 225 shields existed at US 60 as early as 1991. Error US 225 shields existed at US 60 during the 2000s. All shields at US 60 were replaced with standard shields by February 2013. Comment: VA 225's north end is directly across from one of the main access gates to Little Creek Amphibious Base. I remember VA 225 still being a little rural in the mid-1970s in a few places but it is firmly all suburban today. VA 225 #1: Appeared June 1932 as an upgrade to CR 3. Ran from VA 22 (current SR 863) Hanging Rock southeast to the Roanoke City Limits (near the VA 116 split from US 11A-460). The Oct 1932 CTB minutes seem to strongly imply VA 225 was renumbered as VA 207. Today it is parts of VA 419 and VA 116, plus Cove Rd. VA 225 is not on any VDOT map I've ever seen but it does appear on this topo map. Thanks to NE2 with identifying the existence of this route. VA 225 #2: Appeared July 1933 as a renumbering of a small portion of VA 38. It ran from VA 198 west of Cobbs Creek, northwest across a Piankatank River ferry and ending at VA 4 (now VA 33) Hartfield. In 1953, VA 225 was put on a bridge over the Piankatank, leaving behind Mathews SR 701 and Middlesex SR 655. In Oct 1956 (CTB), VA 225 was renumbered as part of VA 3. Creation: VA 226 was created March 1965 (CTB) as a renumbering of US 460, running the way it does now. This is the 4th VA 226. Comment: I don't know why this isn't part of US 460 Business. VA 226 wasn't shown on VDOT State Maps until 1973. VA 226 #1: Appeared June 1932 (CTB) as an upgrade to CR 5, running from the Roanoke NCL north to US 11, VA 33 near Hollins. In Dec 1932 (CTB), VA 226 was extended south into Roanoke, to VA 10 (now US 221-460). In July 1933, VA 226 was renumbered as VA 115. Today, this is the lower bit of VA 115; Hollins Rd up to Tinker Creek which cuts northwest back to VA 115; more VA 115, then all of SR 601. VA 226 is not on any VDOT map I've ever seen but it does appear on this topo map. VA 226 #2: Created July 1933 as a renumbering of VA 631. Ran 4.14 miles in Middlesex County from US 17 near Church View towards Water View. In Sept 1937 (CTB), VA 226 was extended north 1.16 miles to Water View. In Sept 1942 (CTB), VA 226 was downgraded to SR 640. VA 226 #3: Discovered by NE2. Created in Sept 1942 (CTB) as an upgrade of SR 642 from VA 166-170 (current VA 168 Bus-VA 190) Oak Grove north 3.88 miles toward Norfolk. The north end was at today's Battlefield Blvd just a hair north of I-64. In May 1943 (CTB) VA 226 was extended north 3.00 miles over SRs 642 and 644 to the SCL of South Norfolk. VA 226 was renumbered as part of a rerouted VA 170 in November 1943 when this segment was extended through South Norfolk. Today it is part of VA 168 Business plus Campostella Rd. 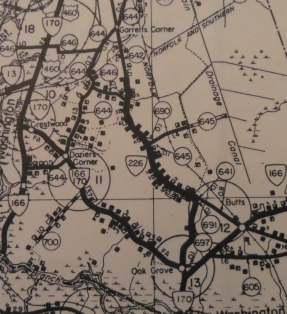 The only map I've ever seen with this VA 226 is in the 1943 VDOT County Atlas. Creation: VA 227 was created in July 1933 as a renumbering of a small bit of VA 30. Ran from VA 4 (current VA 33) to the jct of Cross St and Virginia St inside Urbanna. This is the 2nd VA 227. Adjustments: In August 1933 (CTB), VA 227 was extended 0.30 miles on Virginia St to the WCL of Urbanna. In 1957, VA 227 was put on its current bridge over Urbanna Creek, replacing the original drawbridge. This left behind SR T1004 to the Urbanna marina. Posted: Fully posted; Two cutouts were on SR 602 EB approaching Urbanna. One was taken down in the late 90s while one at SR 602-603 jct was still there in 2007. VA 227 is prominently posted as TO VA 227 at US 17 where SR 602 runs into it northwest of Saluda. Comment: I know it has to do with funding and all, but it aggravates me when a road is posted like SR 602 as "TO VA 227" for several miles from US 17 (prominently, I might add). Just call it VA 227 already. Middlesex County has tried several times over the years to get 227 extended to US 17 without success. VA 227Y? : A VA 227Y is implied on some 1930s county maps and would be a renumbering of either VA 30Y or VA 38Y. Creation: Appeared August 1966 (CTB) as a renumbering of the northern segment of VA 28. Ran as it does today. This is the 3rd VA 228. Adjustments: In March 1970, VA 228 was rerouted off Washington St (no longer there), Station, and Pine Sts and instead placed on Elden directly to Monroe St. In April 2012 (thanks to Paul Wehle for this item), The Town of Herndon petitioned the CTB to move VA 228 out of central Herndon to instead use the western side of Herndon Pkwy between Elden St and Dranesville Rd. This would follow a well-posted VA 228 TRUCK that has been in place a number of years. As best I can tell this has not been done (no CTB action, VA 28 still through town on 2013 traffic log). VA 228 is multilane south of SR 606 (since at least 1995) and also on its Dranesville Rd section (date unknown). VDOT maps still show all of VA 228 as 2-lane. Posted: Fully posted outside Herndon. The last known shield on mainline 228 (Monroe St NB leaving Elden) was removed in 2013 or so. Comment: VA 228 really ends at the SCL of Herndon and does NOT touch VA 267 which is extremely close by. VA 228 is where you can find several VA 606 shields. VA 228 #1: Appeared in June 1932 (CTB) as an upgrade to CR 1. Began at US 11/VA 10 Pulaski and headed west on 3rd St (now VA 99 NB) to Randolph Ave, then north on Randolph out of town for a total of 6.18 miles out to the Weldon area. In July 1933, VA 228 was renumbered as part of VA 99. Today the parts outside the City of Pulaski are SR 738. VA 228 is the highest confirmed number/location for District 2 in the 1928-33 system, and does not appear on any map I have found. VA 228 #2: Appeared in July 1933 as a renumbering of VA 632. Ran from VA 3 Emmerton 6.3 miles south to Sharps. In April 1951 (CTB), VA 228 was downgraded to SR 642. Creation: Appeared Oct 1947 (CTB), mostly as a renumbering of part of VA 29, but also some new construction north of SR 802. Ran as it does today. This is the 4th VA 229. Adjustments: In Aug 1973, the CTB rejected a request by the Culpeper Board of Supervisors to reroute VA 229 via the high school to US 15-29 Business (along SR 694 it would appear). Comment: VA 229 is not in a position to be a through route for anyone outside Culpeper County, although it is usable as a back door route from Culpeper to Warrenton via US 211. It has been suggested to me this should be extended south through Culpeper and replace VA 299. With a little improvement to SR 688, VA 229 could be extended north to I-66 at Markham. VA 229 #1: Appeared in June 1932 as an unidentified new route in District 2. See the VA 227 entry for details. VA 229 #2: Appeared in July 1933 as a renumbering of VA 633. Ran from US 17 to Port Royal. In Sep 1934 (CTB), VA 229 was extended southwest 7.34 miles towards Bowling Green. In 1935 or 1936, VA 229 was renumbered as part of VA 207. Today it is part of US 301. VA 229 #3: Appeared in 1935 or 1936 as a renumbering of VA 207. It ran from VA 51 (now SR 738) Chilesburg to US 1 Ladysmith. In Sept 1942 (CTB), VA 229 was downgraded to SR 639. Adjustments: In Aug 1933 (CTB), pieces 2 and 3 were connected. In Sept 1934 (CTB), piece 4 of VA 230 was extended west to the Madison-Greene Line as an upgrade to SR 612. 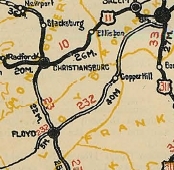 In May 1938 (CTB), VA 230 was assigned to SR 612 between Stanardsville and Green County, connecting piece 4 to pieces 2 and 3. In Sept 1942 (CTB), VA 230 from Madison to Oak Park was downgraded to SR 632, meaning VA 230 was truncated to US 29 near Pratt. In Nov 1942 (CTB), VA 230 was extended south from Crozet to the new US 250 location, replacing a small piece of US 250. 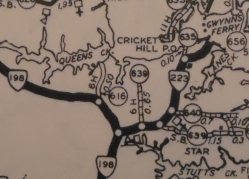 In May 1943 (CTB), because "It is not believed that need for a primary connection between Routes 29 and 250 along this road will ever arise," piece 1 of VA 230 was downgraded to SR 692. In April 1944 when VA 27 was downgraded in some locations, I believe this is when VA 230 was extended over VA 27 from US 29 near Madison to US 15 Madison Mills. 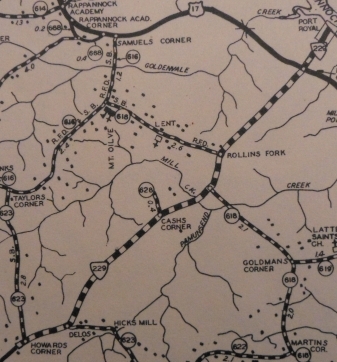 In May 1950 (CTB), VA 230 between US 250 Crozet and US 33 near Stanardsville was downgraded to SR 810. US 250 to Crozet became an extended VA 240. VA 230 rerouted southeast of Madison. VA 230 renumbered to VA 240. Improvements: VA 230 was paved only on the VA 4 and US 29 duplexes when created in 1933. The first mile north of Crozet was paved in 1935. In 1940, VA 230 was paved from Stanardsville to the Madison County line. In Nov 1942 VA 230 was paved from Crozet to US 250 when it was assigned to that roadway. VA 230 was paved when designated to replace VA 27 from US 29 to US 15. In 1948, VA 230 was paved further north of Crozet, to about halfway to the Greene County Line. 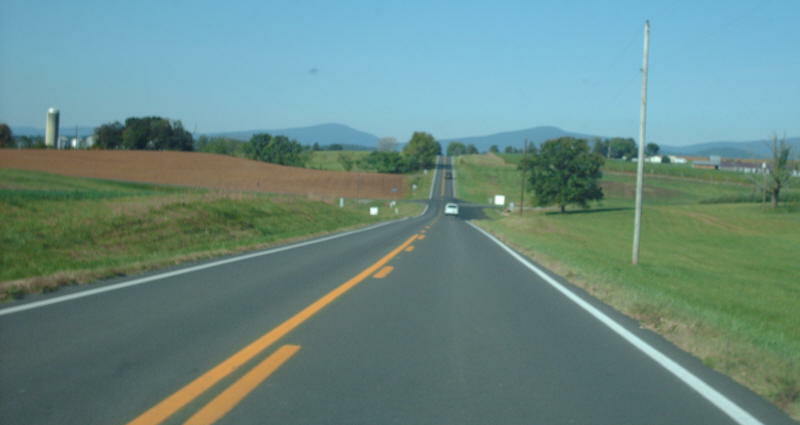 In 1950, VA 230 was fully paved from Crozet to US 33, making VA 230 fully paved everywhere. VA 230 is only multilane on its US 29 duplex, since 1968. Posted: Fully posted; cutouts still exist at the VA 231 jct in 2009. Comment: The old VA 230 between Crozet and Stanardsville is substandard alignment in most places and not that great as a through-route. VA 230 between US 29 and US 15 is excellent, though. I think VA 230 is a pleasant, scenic route. The 1939 VDOT report on primary system development had recommended that VA 230 be decommissioned west of US 29. VA 230Y: Mentioned in CTB minutes as being decommissioned in May 1950. VA 230Y was at the US 33-VA 230 jct (curr US 33-SR 810 jct) west of Stanardsville. With the widening of US 33 this is physically not present anymore. 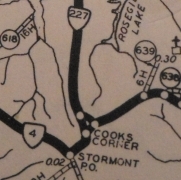 The 1943 VDOT Atlas shows this explicitly, while the 1958 atlas shows this as SR 620. 1. VA 22 Cismont to US 15-VA 4 Gordonsville (renumbering of VA 701). 2. 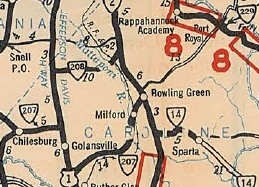 Rapidan River north to Syria (renumbering of part of VA 701 and all of VA 705). 3. VA 340 (now US 340 Bus) Stanley to VA 266 (now SR 689) near Marksville (renumbering of VA 836). Adjustments: In May 1938 (CTB), VA 231 was extended from Gordonsville to the Rapidan River, connecting pieces 1 and 2. In 1940, VA 231 was rerouted to its current VA 230 and US 29 duplexes, leaving behind the more direct SR 687. In April 1944 (CTB), the segment from Barco to Syria was downgraded to SR 670 and instead sent north to Sperryville, replacing VA 27. Presumably at the same time, VA 231 west of the mountains in Page County was renumbered as an extended VA 266 (now SR 689). Improvements: Upon designation in July 1933, pieces 2 and 3 were paved except west of Criglersville on piece 2. In 1938, piece 1 plus the extension to connect to piece 2 were paved. The stub west of Criglersville was paved in 1939. VA 231 is multilane only on its US 29 duplex, since 1968. Posted: Fully posted; cutouts in Madison remain as of February 2013. Cutouts may still exist in Gordonsville and at the VA 230 junction (last verified 2009). Cutouts north of Madison were replaced in the late 1990s. US 231 error shields have existed at SR 609 Barco since at least March 2004. TO VA 231 is posted from US 211 at the US 522 jct. Legislative names: Old Blue Ridge Turnpike, from Orange/Madison Line to SR 670 Barco (12/15/88). James H. Fletcher Bridge over Hughes River (3/15/32). Comment: VA 231 is an extremely scenic ride through the foothills. The segment in Page County suggests it was once envisioned to put a modern road over the mountains in that area. This never happened, though, the original VA 16 actually crossed the mountain here on what I presume was the Old Blue Ridge Tpk. Today it is shown as a trail on the DeLorme. Dave Strong always wondered what F T stood for in Rappahannock County. It is Frances Thornton. VA 231 #1: Appeared March 1924 (CTB) as new primary routing. Ran from VA 23 (now SR T1001) Rich Creek north 1.8 miles to the West Virginia line. In August 1928, VA 231 was renumbered as VA 216. There is a chance this was for some or all of its life running on SR 726 before the primary corridor became today's US 219. Creation: Appeared in April 1968 as new primary routing. Ran only from I-81 1.40 miles to then-SCL of Radford. This is the 3rd VA 232. Adjustments: In Feb 1972 (CTB), VA 232 was extended 2.93 miles into Radford to end at US 11. VA 232 from I-81 to Radford CL. SR 232 according to Official map. Improvements: Paved since inception; multilaning shown starting in 1973 from I-81 to big curve inside Radford. Posted: Fully posted; Odd-looking shields have existed at US 11. Comment: VA 232 provides direct access to Radford from I-81 northbound. 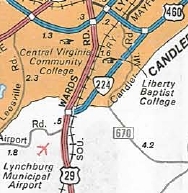 VA 232 first appears on the 1970 Official map and identifies it as SR 232. VA 232 #1: Appeared about 1924, running from VA 23 (now VA 8) Floyd northeast to VA 33 (now US 220 Bus) Roanoke. This appears to have briefly been TEMP VA 23. In May 1926 (CTB), VA 232 was extended southwest over CR 1, 4.6 miles. In March 1927 (CTB), VA 232 was extended southwest 12.7 more miles to the Carroll County Line. In August 1928, VA 232 was renumbered as VA 205. Today it is part of US 221 except north of Bent Mtn VA 232 used SR 711. VA 232 #2: Appeared July 1933 as a renumbering of VA 706, running from VA 16 (now VA 231) to VA 3 (now SR 695) Boston, a distance of 7.7 miles. In May 1943 (CTB), VA 232 was downgraded to SR 707. Creation: Created July 1968 (CTB Minutes) as the access from US 1 to National Airport. This is the 2nd VA 233. Posting: Fully posted at US 1; not posted from GW Pkwy. One cutout at each end existed until about 2000. An error "US 233" shield existed westbound over the CSX rail tracks in 2012. Comments: Only a few feet of VA 233 are not on a bridge. VA 233 #1: Appeared July 1933 as a renumbering of VA 708, running from VA 17 (now US 17) Morrisville via Bristersburg to Catlett, then northeast to the Prince William line. In Aug 1933 (CTB), VA 233 was extended east to VA 28 (current VA 215). In Oct 1940 (CTB), VA 233 north was truncated to Catlett, replaced by VA 28. The endpoint was today's SR 818 Old Catlett Rd. The April 1949 CTB indicate that VA 233 will be deleted when present funds set for the route are expended. It looks like this didn't happen until March 1952. The route was then downgraded to SR 806. VA 233 truncated to Catlett. 2. Maryland State Line above Lovettsville south to Purcellville, plus a mile or so south towards Middleburg (renumbering of VA 721). This has been the only VA 234. Adjustments: In Sept 1937 (CTB), piece 1 was extended north the 1 mile to US 15-50. In Oct 1940 (CTB), Piece 2 was renumbered as part of VA 17. Instead, VA 234 was extended as a future route over SR 734 from Aldie to Bluemont, and as an actual state highway on a very short stub from Bluemont to VA 7, replacing VA 245. In November 1942 (CTB), VA 234 was rerouted at Catharpin to head west to US 15 as it does today. The old route to Gilberts Corner became SR 705 and a private driveway on the west side of US 15 near Gilberts Corner. VA 234 southern piece relocated. In May 1943 (CTB), the Bluemont stub of VA 234 was downgraded to SR 760. Sometime between 1937-58, VA 234 was removed from SRs 727 and 698 at the Occoquan Creek Dam. In April 1967 (CTB), VA 234's south end was moved from central Dumfries to its current location at US 1. This was done to accomodate an interchange with I-95. The old road is Duke St in Dumfries and the part of SR 627 that does not parallel I-95 SB. The piece of VA 234 bypass of Manassas from VA 28 to I-66 opened in 1998. The rest of the bypass opened in 2001. The old route through Manassas is VA 234 Business. VA 234 was placed on a new bypass of Canova around Jan 2003 (mtr posts), leaving behind SR 3xxx. Per VDOT's website, in Nov 2005, the CTB approved the location for a new 10.4 mile north-south transportation link that would connect Manassas with the Dulles corridor. The location of the new road would be north of I-66 from the I-66 and Route 234 interchange to Route 50 in Loudoun County. The possible paths that were studied are shown here (pdf). The chosen path is segments C and D, roughly paralleling SRs 705 and 616 and runs 10.4 miles. Segment C is also the VA 234 portion of the upcoming Manassas Battlefield Bypass. VA 234 was placed on a new bypass of Independent Hill about March 2006 (mtr posts), leaving behind SR 3234, SR 619 and OSR 234. In Feb 2013 (CTB), the Tri-County Pkwy (still called this then even though Fairfax County is no longer in the path) from I-66/VA 234 Byp interchange north to VA 234 was essentially described such that it will be VA 234 when built. Later in 2013 the project begins to be referenced as the Bi-County Pkwy instead. Public meeting brochures from Sept/Oct 2013 imply the entire Bi-County Pkwy will be VA 234 (the original Tri-County Pkwy concept was specifically numbered as VA 411 in 2001. There is an FAQ that talks about what will happen to 234 through the Battlefield but there is no mention of what would happen to VA 234 from Catharpin to US 15 and whether it would remain in the primary system or not. Improvements: Piece 2 was paved upon inception except a from Purcellville to above Wheatland. In 1938, VA 234 was paved north of Wheatland and from Manassas south to Occoquan Creek. 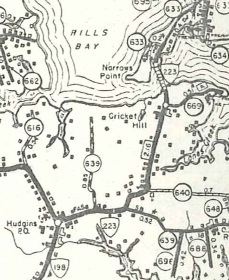 In 1939, VA 234 was paved from Occoquan Creek to Independent Hill. In 1940, VA 234 was paved from Independent Hill to US 1. Also, the Bluemont stub was paved upon designation of VA 234. In 1941, VA 234 was paved from Manassas to US 29. VA 234 was finally paved between US 15 and US 29 in 1950. 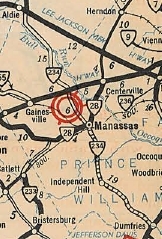 VA 234 was first multilaned between I-66 and Manassas, in 1971. Maps don't show this until 1998 but the 2.5 mile segment of VA 234 between US 1 and Montclair was already 6-laned when I moved to Dumfries in 1995. The Manassas Bypass segmetns were multilane expressway when opened in 1998 and 2001. VA 234 was widened from VA 234 Bus south to SR 644 Hoadley Rd in 2001. The Canova Bypass was 4-laned when opened in 2003. VA 234 was widened on Independent Hill's bypass in 2006. The remaining segments of VA 234 between Montclair and Hoadley Rd were widened about 2007. Posting: Fully posted, including on the I-66 duplex; There is a cutout on a green sign on VA 28 NB just east of the VA 234 Bypass. SR 234 shields briefly abounded on the Lake Jackson area section when first widened but were quickly replaced. In April 2005 Dan F reports 234 in circles at Richmond Ave in Manassas. Comment: VA 234 is now thoroughly suburbanized in a lot of locations south of Manassas. The old VA 234 section now used by SR 705 is still unpaved in places in Loudon County. For some reason the Washington area inset on the 1996 Official shows the lower portion of this as SR 788 which IIRC is actually the frontage road on I-95 NB at VA 234. VDOT is studying improvements to most of VA 234 as part of their "North-South Corridor of Statewide Significance". Creation: First appears on the 2002 Official map as a renumbering of mainline VA 234 through Manassas. Improvements: Paved upon inception; Multilane from Sudley/Grant intersection north to I-66; 6-laned north of Godwin Dr.
VA 234 Business is divided between VA 28 and Sudley, but only 1 through lane in each direction. VA 234 Business is undivided multilane south of VA 28 to Richmond Av. Posted: Fully posted; In a few places on side roads it is posted without the 'BUSINESS' banner. Other names: Dumfries Rd (s of Richmond Av); Grant Ave (Richmond Av to Sudley Rd); Sudley Rd (Grant Ave to I-66). Comment: VA 234 Business north of VA 28 is frequently traffic-choked. VA 234 Business through Manassas. Creation: Appeared in July 1933 as a renumbering of VA 710 and VA 725. Ran just as it does today. This has been the only VA 235. Comment: VA 235 provides easy access to Mount Vernon, George Washington's home. It also provides access to the south end of the GW Pkwy, although it is not well-posted to do this. The 1939 VDOT report on primary system development had recommended that VA 235 be decommissioned north of Mount Vernon. Creation: Appeared in July 1935 as a renumbering of part of US 50 Originally ran from US 29-50-211 Fairfax to US 1 (current VA 400) Alexandria. This is the 2nd VA 236. Adjustments: About 1937, VA 236 east was truncated to US 1's new alignment at Patrick St. In 1945 or 1946, VA 236 was re-extended east back to US 1 at Washington St.
Around 1950, US 1 was moved to Henry St, where presumably VA 236 then ended. VDOT traffic logs show VA 236 running to VA 400. This extension may have occurred as early as 1982. VA 236 was split into one-way alignments in Downtown Fairfax but I have not been able to pinpoint when that happened (before 1995). 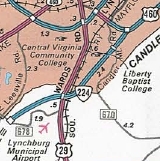 VA 236 was first multilaned in a 2-mile section centered around VA 350 (now I-395) in 1956. 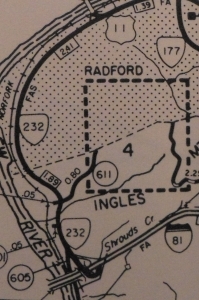 In 1960 or 1961, the multilaning was extended west to Fairfax City. In 1969, VA 236 was multilaned east to VA 241. Posting: Fully posted; vintage white border shield at VA 241 lasted to around 2003; Error SR 236 shield at VA 123 SB still present from at least 1995; new white border shields in Fairfax. On VA 123 NB there is an LED VA 236 shield that illuminates only certain times of day at a left turn signal. Comment: VA 236 is the main route from Fairfax to Alexandria. VA 236 #1: Appeared in July 1933 as a renumbering of VA 711. Ran from US 50 (now VA 236) Fairfax to VA 237 Ft. Myer. This included a lengthy multiplex with US 29-211. Official VDOT maps 1932-1936 are very unhelpful in determining what 236 did, but I believe VA 236 used today's US 50 from Seven Corners to VA 237 as I think VA 711 was on Wilson Blvd but later moved. In July 1935, VA 236 was renumbered as part of VA 237 and US 50. Today it is Old Lee Hwy out of Fairfax; US 29-VA 237 to Falls Church, all of VA 338 and US 50 from Seven Corners to Ft. Myer. VA 236 swaps with US 50. Creation: Appeared in July 1933 as a renumbering of VA 712. Originally ran from US 211 (now US 29) Falls Church east to near VA 236 (now US 50) Ft. Myer. This has been the only VA 237. Adjustments: In July 1935, VA 237 was extended west with US 29-211 through Falls Church and to Fairfax City, where it then replaced VA 236 on Old Lee Hwy to end at present VA 236. In May 1938 (CTB), VA 237 was extended 0.23 miles to US 50. About 1951, VA 237 was removed from Washington Blvd east of VA 120 and placed on its current routing. In 1988, VA 237 was rerouted off Old Lee Hwy and instead onto Pickett Rd. 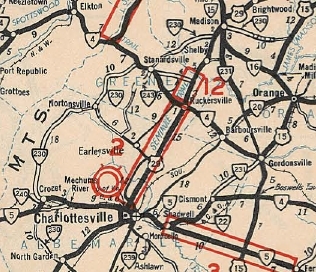 VA 237 was first multilaned on the new alignment east of VA 120 in 1951. In 1965, VA 237 was multilaned on its US 29-211 duplex in Falls Church. The first map to show VA 237 multilaned out to Fairfax is 1975. VA 237 is still 2-lane between US 29 and VA 120. Posting: Reasonably well-posted in Arlington County except not between US 29 and VA 120; No longer posted in Falls Church - 1 shield in Falls Church, WB at VA 7 (a cutout) was up into the 2010s although a second cutout was still present on VA 338 into the late 90s; Not well posted west of Falls Church - only at VA 243 and Fairfax Circle. Not posted at all on Pickett Rd or at VA 236. Russ Blau reported a wrong-way shield at I-66/US 29, which was still there in 2008. Comment: VA 237's posted routing largely makes no sense. Arlington to Falls Church would use US 29 and Arlington to Fairfax would use US 50. 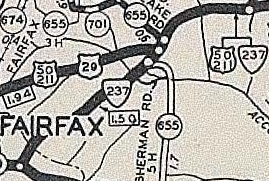 The US 29 duplex does not appear on officials until the 1960s, but is explicitly shown on the 1936 Fairfax County map. The dogleg at Fairfax Cir. is particularly bizarre, since a short section of Blake Lane provides a more direct route. Creation: Appeared in October 1940 as a renumbering of VA 170. Initially ran from US 60 Lee Hall to Moore House east of Yorktown. This is the 2nd VA 238. Adjustments: In Oct 1945 (CTB), VA 238 was rerouted away from Moore House and instead went southeast to what was then a Naval Fuel Depot. The road to Moore House became SR 676. In May 1959 (CTB), VA 238 was rerouted along the east edge of Yorktown to accommodate the Battlefield Visitor Center. The original route used to go due north from the current VA 238-SR 1020 intersection then met Zweybrucken Rd at its pullout. Starting in 1959 VA 238 used Ballard to a relocated Zweybrucken. The old direct path is no longer a road. In March 1987 (CTB), VA 238 was rerouted in Yorktown - instead of Zweybrucken-Main-Ballard, it replaced SR 1001 along Ballard St. curling around to south of Yorktown. In Aug 1990 (CTB), VA 238 was rerouted away from central Yorktown by using SR 638 Goosely Rd. The old route through town became SR 1020. Posting: Fully posted; cutout at its eastern end lasted to about 2004. Other names: Yorktown Rd (Newport News); Old Williamsburg Rd (York line to SR 1020); Goosely Rd/Cook Rd/Ballard St (east of SR 1020). Comment: VA 238 also serves the Yorktown Naval Weapons Station near its western end. From 1958-91, VA 238 did not directly connect with US 17 as it passed under the Coleman Bridge. VA 238 was once part of US 17 until the early 30's. VA 238 #1: Appeared in July 1933 as a renumbering of VA 713. Ran from VA 7 Clarks Gap through Hillsboro to the West Virginia line heading for Charlestown. VA 238 originally had a duplex with VA 234 (now VA 287) from Wheatland south to current VA 9-287 jct. This may have been removed in 1939. In October 1940 (CTB), VA 238 was renumbered as VA 9 to match up with the older WV 9. Waysides lists through the 1948 Official continued to refer to VA 9 as VA 238 in error. Creation: Appeared in March 1968 (CTB) as an upgrade to SR 681. Originally ran from US 58-460 ALT east to VA 337. This is the 3rd VA 239. Adjustments: In Feb 1984 (CTB), VA 239 was extended west to VA 337 from US 58-460 ALT. Improvements: Upon designation VA 239 was paved. The first official map to show VA 239 as multilaned is 1980 but I know from experience it was 4-laned at least west of US 17 by the mid-70s. Posting: Fully posted except not from I-264. Comment: VA 239 provides an alternative for VA 337 to get to the Jordan Bridge. VA 239 has one of the deepest median ditches I have ever seen. VA 239 #1: Appeared in July 1933 as a renumbering of VA 714. Ran from VA 5 (now 5th and Main) Charlottesville southeast 1 mile towards Monticello. VA 239 may have also extended northwest on Preston Ave out to Rugby Rd (then-US 29), or it could've been an unnumbered primary route in an independent city. The July 1935 Albemarle County map did not show this. In Oct 1935 (CTB), Preston Rd was removed from the primary system. 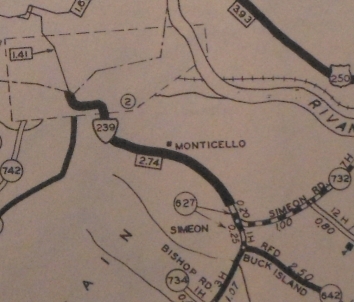 In Sept 1937 (CTB), VA 239 was extended southeast 2.25 miles over SR 627 to SR 732 near Milton. In Aug 1941 (CTB) was renumbered as part of VA 20. Today it is VA 53 from Michie Tavern to SR 723; Michie Tavern Ln, which ends about 0.5 mile from VA 53; north of I-64 it is Monticello Rd in Charlottesville, which VA 20 closely parallels; a bit of 9th and a bit of Main St.
VA 239 #2: Appears in several CTB references from 1942-44 as the Hampton Bypass, under construction at that time. When it was finished in 1944 it was actually signed as VA 258, Mercury Blvd. 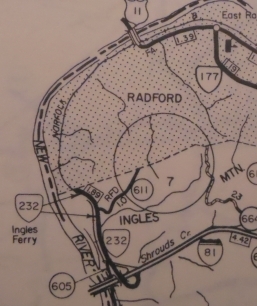 I have not seen this labeled on any VDOT map, but it does appear on the 1944 topo map. Creation: Appeared in Nov 1942 (CTB) as a renumbering of a piece of US 250. Ran from VA 230 (now SR 810 Crozet east to US 250 Mechum River. This is the 2nd VA 239. Adjustments: In May 1950 (CTB), VA 240 was extended south from Crozet, replacing VA 230 down to US 250. Posting: Fully posted; cutout in Crozet removed around 2000. Legislative names: Three Notch'd Road (SR 810 east to US 250), designated 12/18/86. Comment: VA 240 provides a slow-moving access from US 250 to Crozet. VA 240 #1: Appeared in July 1933 as a renumbering of VA 716. Ran from VA 5 (now VA 240) Brownsville east to VA 5 (now VA 240) Mechum River. In Nov 1942 (CTB), VA 240 became part of US 250. VA 240 used SR 751 on its western end and SR 752 on its eastern end.